This week's top pick is a film that has been at the forefront of critical discussion for the past few months. Having come from the micro-indie world - i.e. not the glossy David O. Russell type of "indie" - Ava Duvernay probably never anticipated the intense level of debate and politics that met her latest film "Selma". This Martin Luther King biopic is now known for its Oscar "snubs", but when I finally sat down to watch the film this week, I was surprised to see that it wasn't the obvious "Oscar bait" that the public outrage would suggest. "Selma" refers to the city of Selma in Alabama, where Martin Luther King Jr. lead a historic civil rights march in 1965, in an effort to rally support for the eventual Voting Rights Act. It was a time of civil unrest, as the Southern states of America were desperately trying to hold on to their traditional way of life, namely the segregation of whites and colored people. In the lead-up to the march, various factions within the black community had begun to rise up against a social state of inequality that had become increasingly untenable. The people needed a leader however, to put up a single united front to fight for equal rights for all citizens. That leader came in the form of a pastor and social activist named Martin Luther King Jr. This film follows his brave efforts to make the African-American Civil Rights movement a national issue, fighting to make it a priority for President Lyndon Johnson and successfully garnering support among blacks and whites alike. Unlike most biopics, "Selma" doesn't seek to chronicle the entire life of its main subject. Instead, as its title suggests, it's a contained piece that highlights the social and political climate of a specific time in American history. In one of the very first scenes of the film, Duvernay instantly conveys the urgency of the period through a harrowing act of violence. Anyone familiar with the "4 Little Girls" incident - stunningly captured in Spike Lee's 1997 documentary - will immediately feel a sense of dread as a group of young black girls cheerfully descends down church stairs to meet their eventual demise. It was one of numerous such incidents of hateful crimes that swept through the south, many without any form of legal punishment. By putting this scene at the forefront of the narrative, Duvernay instantly taps into our basic humanity and empathy. That bombing scene is just one of many standout moments in "Selma", as the film is littered with many great scenes. From minor ones like a late night phone call from Mahalia Jackson to the more eventful, visceral attack on the Edmund Pettus Bridge, each succeeds as its own individual vignette. Once again, Duvernay has collaborated with the talented cinematographer Bradford Young and his work here is as evocative as ever. Under his watchful eye, all the actors are able to flourish, proving the film's exceptional casting. Most significantly, David Oyelowo is terrific as King, creating his character from the inside out. His work delves into the man behind the speeches and soul-stirring rhetoric, revealing a modest individual with a heavy load to bare. The weariness of the performance sticks with you, that furrowed brow conveying so much. 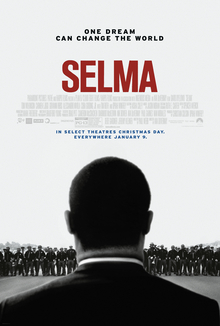 I was truly captivated by "Selma" from beginning to end, but it also came with feelings of reservation. Blame it on the overwhelming power of its original song "Glory" or the universal critical acclaim. Either way, I must admit that it lacked the agitated narrative thrust that I was expecting from its central conceit (i.e. the march and the resulting social upheaval). As I stated in the intro, it's not the "Oscar bait" you'd assume it to be, delivering subtlety and texture rather than pomp and circumstance. It's an inspired approach, but I did feel that it could have used a little more of the latter. In the end though, I'm left with immense appreciation for Ava Duvernay's artistic vision, both in this film and in her filmography as a whole. She has proven herself to be a unique storyteller when it comes to "black cinema", taking narratives about the African-American experience and infusing them with a universal empathy. Whereas others may deem it necessary to make their characters assert their blackness (through a soliloquy about the virtues of fried chicken for example), she finds the common American struggle within her stories, removing all the extremism of poverty and pitiful sorrow. If you want to know what kind of filmmaker Duvernay is, just look at the scene in this film where Amelia Boynton (Lorraine Toussaint) comforts Coretta Scott King (Carmen Ejogo) by reminding her that she is descended from a strong people who weathered the storm of slavery. It's a scene that filled me with such pride and made me so grateful to have such a fresh voice in contemporary cinema. Ava Duvernay is a vital filmmaker and this is an essential black film. Go see it. I really need to see this. We almost got to the theater to see it, but the timing was just off. We rarely have time away from kids...and the local theaters weren't showing this...so we couldn't work out enough alone time to make the drive. Great, balanced review! Thanks Andrew. This film had so much baggage with it that I had to make sure that I tried to be as objective as possible. I'll be interested to hear your thoughts on it.